Just a quickie to wish you all a happy new year for tomorrow and to let you know that I am still around (just!) and will have a crafty post tomorrow! Just not finding the time at the moment and have just caught a cold which hasn't helped (still have to drag myself in to work tonight)! Thank you all for still dropping by when I have been so bad and not visited anyone! It will continue to be like this for another month - hope you can bear with me :/ as I sure can't wait to get my mojo back and play with all the crafty stuff I got over christmas (hubby got me LOTS of Copic ciao markers :D) plus all the lovely DT stuff which is starting to land on my door and I really must try and start using! I am sooooooooooooo sorry for not posting or visiting but my days have been taken over by work at the moment and any spare time has gone into sorting out christmas and hubby! He is fine but just not very mobile as he still can't put any weight on his ankle yet. I'm at work all day and don't get home till 11pm by which time I'm in no mood to craft just want to crash and chill for a couple of hours before bed! Anyway, hope you understand and I hope to get some mojo back in the new year as it should be less busy and hubby should be back on his feet by the end of Jan (fingers crossed) although I do have my sister visiting for a week then too so shall have to see! Even though I've not had time to craft I've managed to shop for more stuff (well I need something to cheer myself up during my lunch breaks at work and luckily we have pc at the shop LOL) and have got myself some of the lovely new Sarah Kays over at Silly Monkeys (though not had a chance to use them yet! 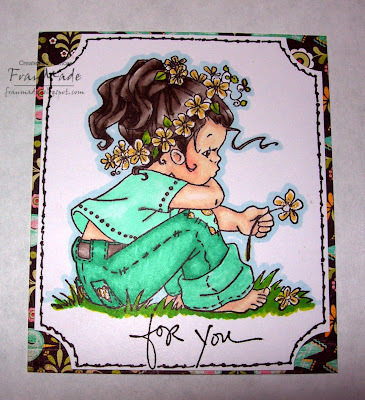 ), some of the new Leanne Ellis stamps over at Funky kits and just managed to sneek into the last post for some new Magnolias over at crafts u love yesterday! I've got lunch off today so have managed to quickly knock this card up as it didn't require much colouring (It's from the Kerry Jo christmas set)! 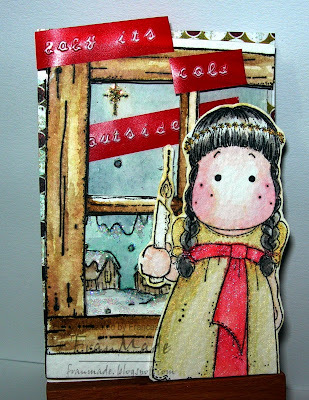 I know I'm late but I think this can qualify for both this weeks CCT (which is an open theme) and for Tilda & Friends ATC as the central image is ATC size (I think the girl is cute and round faced enough and it is christmassy). Both challenges will be back on the 7th and 8th and I hope to be able to get mine done in time for those ones! Also hoping to pull my weight a bit more with my other DT roles and should have some fabulous new Whiff of Joy releases to share with you and other fab goodies from Silly Monkeys and Toodles and Binks. Until then I would like to wish you all a happy and relaxing (!) christmas with your family and loved ones and hope 2009 will bring you good health and happiness! CCT this week is to use your punches (not die cuts) so I've used a couple of my Martha stewart border punches, scallop dots and picket fence (can just about see them behind the main image) and the leaf 'frond' punch too. The image is one of the new Toodles & Binks stamps, Matthieu & Arthur, think he's so cute (if you look on the Toodles site you will see sneek peeks of 2 more new ones, both boy stamps too). 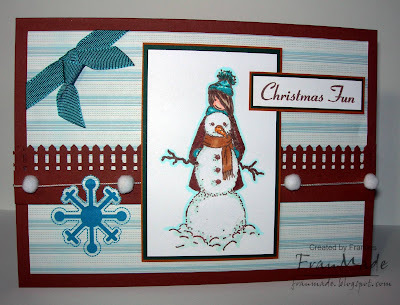 Yeah, managed to make my ATC for this week's challenge which has the theme of 'frosty'. So, another quick creation from me. Stamped trees in the background and simply cut out and stuck Tilda in front. 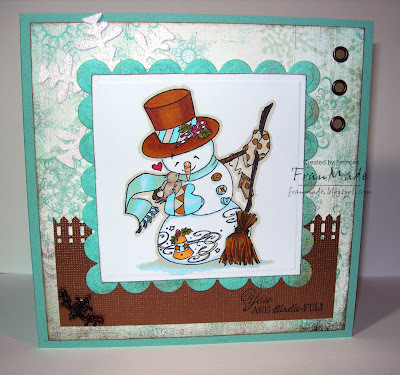 Used lots of 'decoart snow writer' and glamour dust on the trees to try and give it a frosty look. 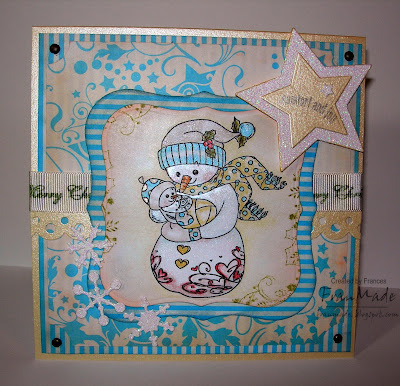 'winter wonderland' made with ATB tapewriter. Just noticed I've not cut out the bit of white card between her legs . .oops! Hello! Still not finding much time for crafting at the moment but did manage to knock this up quickly the other night as I needed a birthday day for FIL and didn't think he'd appreciate my 'cute' cards LOL. Back to basics with good old heat embossing and a bit of matting and layering! 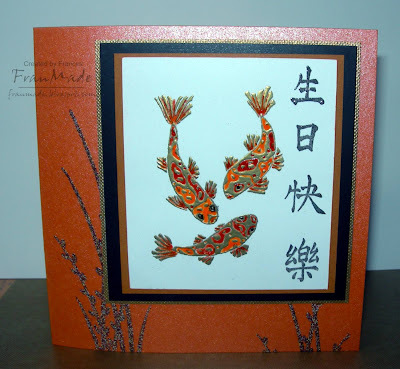 I used Sakura glaze pens to colour in the fish after embossing with gold embossing powder. I like the enameled cloisonne look you get with it. Hubby liked it so that's o.k! Managed to make my 2 DT cards on my day off so will have 2 more posts this week (Wed & Thurs) anything else will depend on how creative I feel at the end of the night when I get in! Will try and do a bit of a blog hop during my lunch breaks this week and try and catch up with everyone. Have a good week. This week has been manic so no time to be creative unfortunately. Luckily I had this Herb image already coloured in sitting on my desk and it had hearts on it so it fitted this week's CCT theme of 'hearts'. Managed to quickly knock this one up late last night (think you can tell as layout is so simple and bare!) I love the sentiment that is from WoJ too, just think it's so funny with this stamp. Coloured with distress inks and twinkling H2O's and everything else is from my stash. I tried and tried to come up with something for the Whiff of Joy Project of the month, which was to decorate a cookie tin or container but it just wasn't happening so just left it at this! 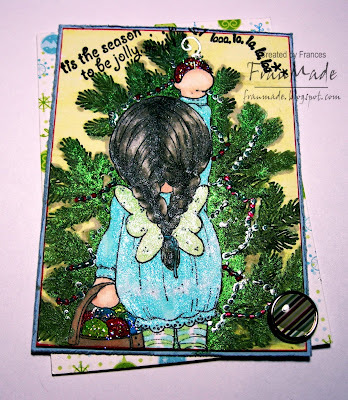 I have used Willow with cookies, masked her then stamped the christmas tree so it is in the background. It did start out bigger but the bag I made was very small so had to cut the image down to fit. Image has been coloured with Promarkers and all I've done is cut it out with my labels nesties, stuck it to the bag then added a felt flower (Tesco's xmas decorations - garland of 12 of them for £1.50, needless to say I grabbed a few :)) and ribbon - very boring and not at all happy with it but that's all I've got for now! Just drove hubby for his check up on his ankle and have left him there (I've had to start driving again after not having too since I passed my test over 17yrs ago . . yikes! thank goodness we have an automatic!) Off to work now for the rest of the day/evening. Hope to try and sort myself out bit better for next week. P.S I know I promised to send my candies yesterday but haven't had the chance yet, will do them either this afternoon or tomorrow- sorry! Thank you to everyone who entered my WoJ candy (donated by Katharina). The 2 winners are . . If you weren't lucky enough to win then pop on over to Katharina's blog and try your luck with the WoJ daily advent calender candy draw. Hi, have you missed me?! Apologies for not posting anything for the last few days but I'm afraid my blogging/crafting time will be seriously limited for the next couple of months. The reason? Well I mentioned hubby did his ankle in a couple of weeks ago thinking he'd just strained his tendon but he had in fact fully ruptured his achilles tendon which meant he's had operation to repair it (have been very impressed with the efficiency and standard of our local hospital, he went in Thurs for test and they offered surgery for the next day). So he is now in a cast and out of action for at least 4 wks before he has physio to start walking again. As we have our own business it just meant I suddenly had to go from helping out a bit to working full 6 days now :( but at least hubby is on the mend now. Hope you will bear with me until things return to normal. I'll try to post a few cards just to keep my blog going and to meet my DT duties but if I'm not 'around' much for the next 2 months you'll know why. CCT this week is 'lilac'. 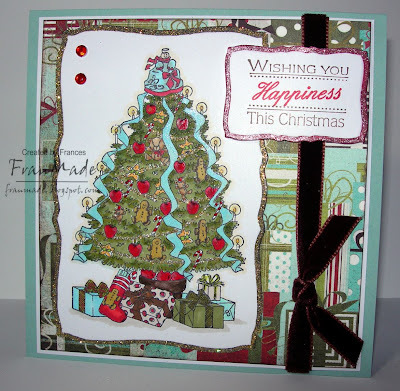 So nice refreshing change if you've been making christmas cards in reds and greens and other more christmassy colours! I could have made a lilac christmas card but fancied a break and it was good excuse to ink up this gorgeous new stamp from Toodles & Binks. Well, thanks for stopping by and I want to wish any US readers out there a happy thanksgiving day! ATC theme this week is 'warm & cozy' which immediately makes me think indoors, in front of a fire. However I made a tilda card in front of the fire not long ago and didn't want to repeat myself. So ran with the 'indoors' theme and came up with this . .
All stamps are from the current christmas/winter Magnolias and the window has acetate 'glass panes' and is raised on foam pads so that the snowy scene outside looks like it's in the distance and Tilda is nice and snug inside :) Stamped onto watercolour paper and coloured with distress inks and twinkling H2o's. The scene outside has lots of snow and glitter added. The sentiment (typed out with ATB tapewriter) just seemed to fit plus I'd just finished watching 'Elf' so had that song stuck in my head (love that movie, so funny) :)! Hope you're all keeping warm and having a good week. See you tomorrow for CCT. Pick 5 bloggers that you consider as your best blogging buddies and deserves this award for their contribution towards the blogging community, no matter what language.-State the name of the author of each blog as well as a link to each one's blogs.-Each blogger (upon acceptance) of this award should do a post and show the award on their blog and put the name and link to the blog that has given her/him the award.-Link to DOING LIFE's blog, so everyone will know the origin of this award. Kathy beat me to it as I was going to pick her but the fact she picked me too (great minds think alike LOL) just got me thinking that in theory the 5 you pick are more than likely going to pick you so rather than try and see who's fastest! I'm going to leave this for ALL my blogging buddies, who drop by every week and always leave me such lovely comments - you'll know who you are hopefully ;D !!! 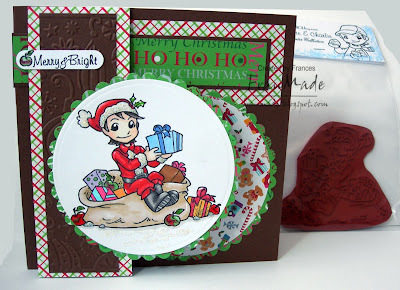 Speaking of WoJ, if you love these stamps and would like a shot at guest DT for the next 2 months, you need to head on over to Katharina's blog for details of how to enter - good luck! Off to spend day with Hubby now so will try and catch up with everyone later tonight or tomorrow. Have a lovely, if not slightly chilly, Monday! So after a mega busy weekend at the shop (does the cold weather make people want more take-out food because it was manic ?!!) 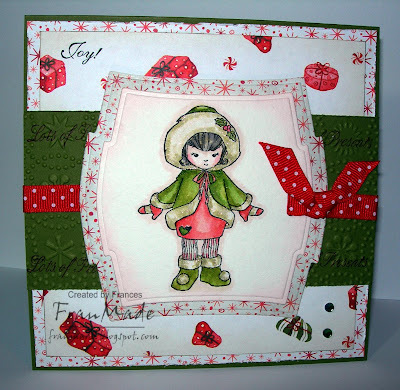 thought I'd give christmas cards a break and made this just to unwind (hence another simple layout, nothing too taxing)! Love Sarah Kay and the new ones will be out soon, just in time for xmas wish lists ;), which will include this cutie (which I already had from before Stampevie got the license). 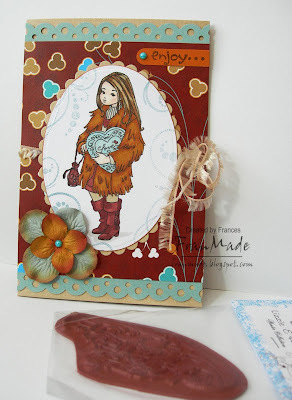 Then realised I can enter it for the spoonful challenge this week, 'blooming marvelous'! It really feels like winter now, brrrrrr. Although living in the north west, near the coast we seem to have missed all the snow, it's just very wet and windy. . . Perfect weather to stay in and get inky :) . . but then I really must start sorting out christmas presents this week, seeing as it's end of Nov already, eek! "This blog invests and believes the PROXIMITY - nearness in space, time and relationships! These blogs are exceedingly charming. These kind bloggers aim to find and be friends. They are not interested in prizes or self-aggrandizement. Our hope is that when the ribbons of these prizes are cut, even more friendships are propagated. Please give more attention to these writers! Deliver this award to eight blogger’s who must choose eight more and include this cleverly-written text into the body of their award." Didn't manage to make as many cards/blog hop as I thought I would - got sidetracked by sorting out bits in my craftroom the other evening and then weekend = work (total opposite to most people I know!). You know how it is, start off wanting to just tidy up one thing and then it all snowballs which is why I try not to have too many tidying sessions LOL. So now I've only got the one card to show and it's not to any challenge, just what I thought best for the image. Not going to list materials etc as pretty straight forward and I didn't think it needed much else as I wanted the image and sentiment to be the main focus. Used my Promarkers and lots of glitter, stardust pens and clear glaze pen over the apples so nice and shiny - not sure if you can see that when you click on photo. Any questions just ask. Will try and catch up with everyone's blogs etc tomorrow, as off to work soon. Have a lovely evening. 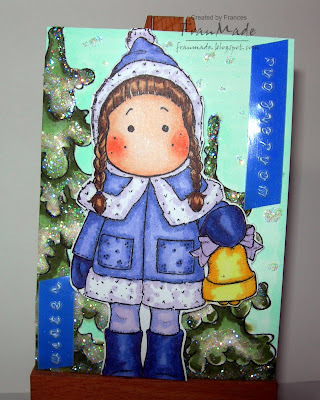 CCT theme this week is 'snow & snowflakes' so perfect excuse for me to ink up a couple of my Herb stamps but just looking at them I've just realised one is a 'she' so I think I'll call her Herbette LOL. Anyway, this is a nice simple card I made, all stemming from scrap piece of DP I had on my desk. Images: 'Herb' and 'Herb with teacup' from Whiff of Joy stamps, cut out and stuck on with silicone glue so that they curve off the card. Sentiment is 'christmas wishes' set from Whiff of Joy too. 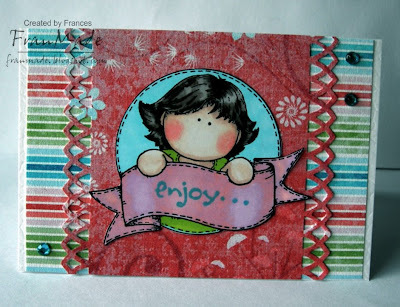 Paper: BG Wassail dp and matching red card from scrap box. Snowflake cut from white glitter card. Others: ribbon and brad from stash. 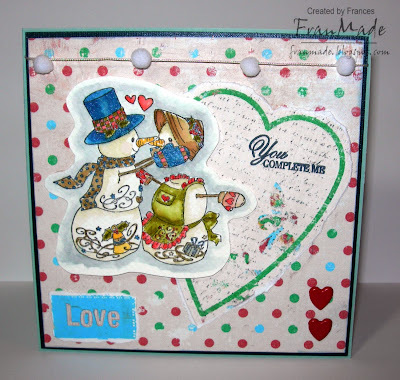 Glittered around the sentiment with glue pen and glamour dust. 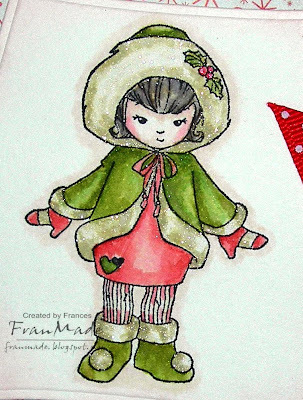 Wasn't sure I was up to tackling Fri sketchers this week but then it all fell in place once I selected to use this big fireplace stamp and this cute tilda from the winter kit. It was just a case of cutting up dp to go behind it all and as the stamp was so big and detailed I didn't need to add anything else. 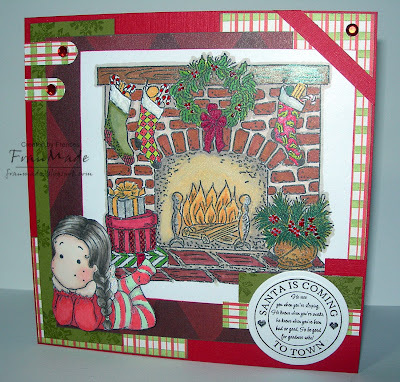 Images: fireplace is a creative expressions stamp from Sir stampalot. Tilda and the snowflakes on the green panel are from the Magnolia winter kit, circular santa sentiment from Magnolia christmas/winter '08 collection. Paper: DCWV christmas stack from 2 yrs ago I think. Others: word window punch to cut out the 2 little tabs (top left) then 3 gems to finish. Top right of card looked a bit bare so I stuck scrap red strip going across which I think works quite well - kinda reminds me of the wooden beam you get across a room and I think balances the card out better. Tilda & Friends ATC theme this week is 'time to decorate' so anything to do with christmas decorations and it doesn't have to be magnolia stamps (see blog for details). 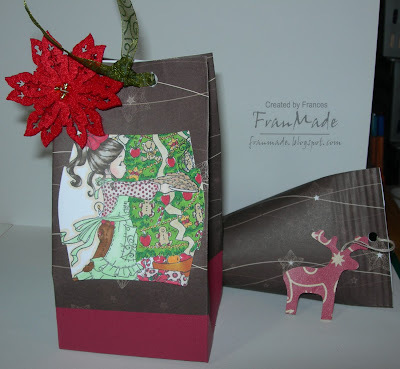 There's a fab Tilda & presents stamp for one lucky participant this week, so why not give it a go. I've used Tilda decorating (just love her) but I didn't get the magnolia tree stamp that goes with her. Instead I remembered I had this very old christmas set which has some fir branches in it and I knew I could use that when I bought this Tilda. So I stamped and masked Tilda then just stamped random branches all around her in the shape of a tree. I've coloured with Promarkers and twinkling H2O over the top for that added sparkle and glitter. Diamond glaze and glamour dust over the baubles then the tinsel around the tree created with liquid pearls (not used those in years!) Then it's been matted onto a bit of scrap blue card and I found a scrap of dp which had baubles on it so stuck that on at an angle. Then little sentiment added across the top and a brad in the corner. I'm afraid the photo's a bit dark but if you click on it you might be able to see it all better. That's all for now (may be back later if I finish the card I'm working on before work tonight, if not see you tomorrow for CCT). I'm back with a card, as promised. Was going to do one of the 'gazillion' challenges that are around but then I was taking so long trying to decide on image and sketch etc that I stopped myself and just simply made a card without it having to fit anything - think I sometimes forget that I am allowed to do that, LOL! 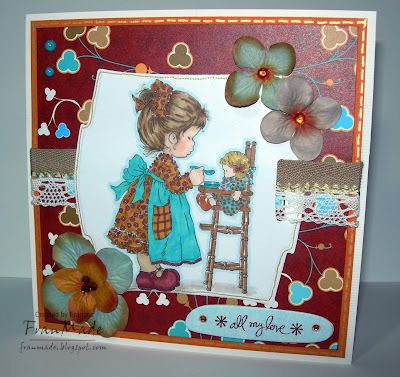 Used another of the gorgeous new 'Whiff of Joy' releases, this is Lizzie and I think she is just too cute. I've watercoloured her with distress inks and sakura stardust pen on her fur trim (so super sparkly). Chalked around the edges after cutting with my other set of nestabilities labels (just love these new sets). 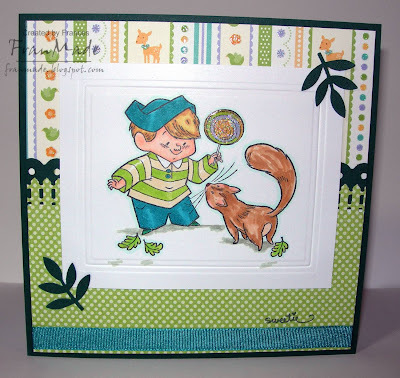 Used embossing folder on scrap of green card and the dp is from an old DCWV christmas stack. The sentiments ('joy' and 'lots of presents') are also WoJ stamps then the only other things I've added are ribbon and a couple of gems from stash. Have a lovely evening and I'll be back tomorrow with my Wed ATC.
. . . out of the 295ish entries (had a few duplicates so ignored those) I had, using random.org . . .
which would make it . . .
Congrats Bernie! If you could email me I will send you your goodies this week. Thanks to everyone who entered and for all your lovely comments! Hopefully you'll have better luck elsewhere (as I've noticed quite a few blogoversary candies around at the moment, seems Nov was a popular month to start a blog :)) If you're still after some more candy I've still got some WoJ goodies to come in a couple of weeks . . so keep your eyes peeled! Hopefully be back later this evening with a card, until then, have a good day! I'll be back tomorrow to announce the winner of my candy and hopefully with a card too. I shall leave you with 2 quick gift cards/tags I did recently but haven't got round to showing. Just really simple, images coloured with promarkers and matted onto scrap DP. One's 'Daisy' from Sugar Nellie and the other is a cute Hanglar girl. Have a good evening and remember to warm up properly before excercise!! Hope you're all having a good weekend. 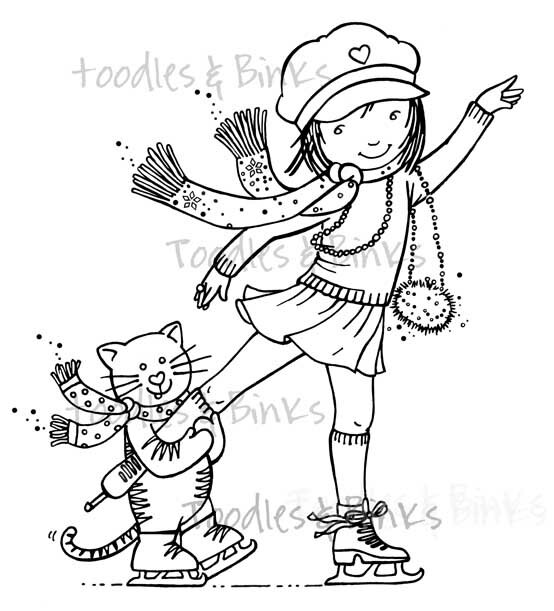 Just a quicky to say . . have you seen the 2 newest additions to the Toodles & Binks stamp range? 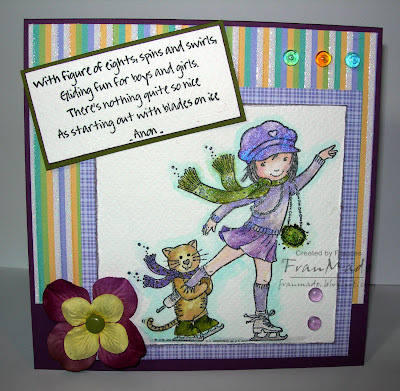 This is Toodles & binks and there is a fab sentiment stamp to go with her. The second one is just a sneek peek but he looks so cute, can't wait to see the full image. Details here and there's candy too if you can guess the names of him and his friend. So pop on over and have a go - good luck! O.K the weeks are just going by way too quick for my liking, how come it's Fri already? and we're already half way through Nov? I haven't done anything for christmas yet - no lists, no purchases, nothing. Was way more organised last year and had all the presents bought by now, best get my skates on, eh?! Anyway, at least I'll have the cards ready, LOL. Here are two more. This first one is a 5x7 " card (I do like this size as alternative to 14cm square cards as the other standard rectangle sizes I either find too small or too big!). It's 'non cute' and is for the Penny Black challenge of 'sentiment only'. This PB stamp is huge so doesn't really need anything with it! Just used the black and white scraps from my earlier Lizzie card and teamed it with some silver mirri card and a splash of red ribbon to tie in with the holographic black embossing powder I used on the text which has flashes of red and silver (you probably won't be able to pick up in the photo). 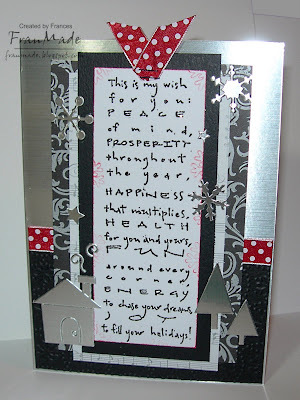 The silver die cuts are various cuttlebug dies and the black piece at the bottom has been embossed with the snowflake folder and that's all there is to that one. Not that keen on it but it'll do for my 'non-cute' pile. papers: Last years DCWV christmas stack and white glitter card. They already had the 'dirty' look to them I just added more around the stripe mat to make it 'pop' a bit more. Tools: spot my new nestie, heehee? I've been wanting the new 'labels' set and finally found some in the UK ( 'Once upon a stamp' if you're interested, £16.99 and if you get 4 sets it works out £15. First time I used them and no probs - got them in 2 days. Exchange rate not that great anymore to buy from the US- works out about the same now doesn't it! :/) This is 'labels 1' but 'labels 2' is fab as well. The stars are nesties too. 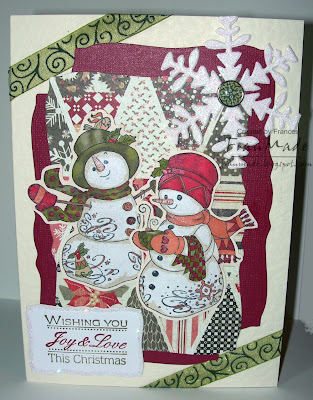 Martha stewart scallop dots border punch, corner punch and snowflake die used too. Others: Ribbon from stash - just stamped 'merry christmas' across it with green StazOn ink and olive green brads (I know they look black in photo) added to just add splash of colour besided the blue and vanilla. Have a fab weekend everyone.